Ask fellow campers about "Calais Motor Inn" and nearby attractions. This is a parking lot separate from the Calais Motor Inn. The best thing about the site is that it is very close (1 mile??) from the Canadian border so a good place to stop on your way to Atlantic Canada. 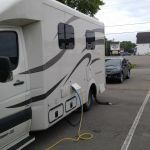 They have 4 RV sites; 2 of have full hookup and 2 just electric. No bathrooms or showers. Not much for the price - that is, now showers, restrooms, etc. It would be more cost effective to stay in the local Walmart! We camped at Calais Motor Inn in a Motorhome. This "campground" is just a parking lot, but two of the spots have full hookups. Another two have electrical hookups only. This area is next to an adjacent part of the motel, across a small street, just NW of the main motel parking lot. We were in spot #2 which required running our water hose across site #1 to hookup. Electrical hookup required a 50-to-30 dogbone since the panel didn't have a 30-amp plug that we were familiar with. In site #2, the sewer was in the middle, but since we have a short RV, it was perfect... others might have a long run to connect it. The site was perfectly level, all asphalt. Motel personnel were all very nice and helpful; we needed to leave the RV there for several days (not hooked up) and they didn't mind. There is a men's and women's restroom by the motel restaurant, no showers. There was a bit of traffic noise but not bad. The motel has a large pool, but we didn't ask about access. The restaurant on-site looked popular but we didn't try it. All ratings are based on what it is -- a full hookup parking space -- and not comparing it to a typical campground. Great spot for an overnight and close to a Walmart and a few other stores, and a few restaurants. We camped at Calais Motor Inn in a Motorhome. Walmart very close, a few restaurants within walking distance, but we opted instead to go to 'Nook and Cranny' which has a very poor-looking outside that hides a very nice inside and great food! They tell you what it is, and it is what it is. There are 5 or 6 sites in a parking lot. Site 1 and 2 are full hookups, although site 2 has the hookup to water that is located in site 1. 50 amp is available in site 1 and 2. The other sites are just electric: no water, no sewer. There is a pool at the motor inn, but it was closed. I think it would be available to RV users. No bathrooms or showers. It is convenient for an overnight stop after crossing the border and to the grocery store, Wal-Mart, and downtown. Great place to stop and re-provision after Canada. The motor inn staff were friendly and helpful. We would use this place again. 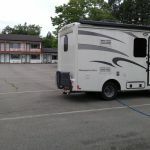 We camped at Calais Motor Inn in a Travel Trailer. Park only has 5 or 6 spots of which only 2 have sewer hookups and only 1 to my knowledge had 50 amp electric. All asphalt like parking lot. We found it adequate for an overnight stay,. We camped at Calais Motor Inn in a Motorhome. Not a bad park for an overnight stay. Our site was wide enough and the utilities including the cable worked well. There was a little noise at night so we rated it a little lower but otherwise OK. We camped at Calais Motor Inn in a Motorhome. 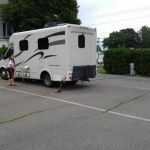 Not really an RV Park, however if one is traveling to/from Canada and need a place to stay, it is very convenient. It is across a minor road from the Motel that owns it, next to where they have an annex. 2 sites have sewer, with a total of 5 sites. We have used it for years over the International Festival. It is close enough that walking to the city center is a nice walk, either by sidewalk or via a Nature Trail along the river. We camped at Calais Motor Inn in a Fifth Wheel. Are you affiliated with Calais Motor Inn ?